--Adam Roberts, a well-known skier in the Pacific Northwest, was killed in an avalanche on Tuesday. Here is a photo remembrance from the Mt. Baker Experience. Here is some information about the avalanche. And finally, here's a second report and a video about Adam from Snowbrains. --The Spokesman Review is reporting that, "A professional ski guide has been named director of the Wallowa Avalanche Center, replacing a director who was killed in an avalanche last spring. Victor McNeil fills the vacancy left by the death of Kip Rand, who died in an avalanche last March while backcountry skiing near Chief Joseph Mountain in the Eagle Cap Wilderness, the Associated Press reports." To read more, click here. --The Spokesman Review is reporting that, "Spokane photographer Rika Ream traveled to Palouse Falls State Park near Washtucna during last weekend’s bitter cold weather to marvel at the ice around the 185-foot Palouse River waterfall. The jaw-dropping white scene was mesmerizing, and a pair of daring ice climbers dropped her jaw even farther. A photograph she captured of the climb has frozen the attention of a few Washington State Parks officials, too. The image she posted on Sunday on Facebook shows Jess Roskelley of Spokane climbing up the vertical wall of fragile ice in the frosty mist of the main waterfall. Scott Coldiron is belaying from below." To see the photo and to read more, click here. 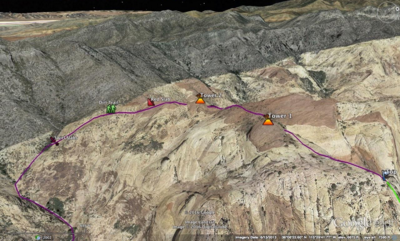 --In mid-November, the Southern Nevada Climbers Coalition sponsored a trail construction and erosion project on Red Rock Canyon's Pine Creek Trail. To read more, click here. --After the success of the recent World Cup competition in Durango, the question remains: should ice climbing be included in the Olympics? To read more, click here. --The Coloradan is reporting that, "the occurrence of two avalanches large enough to kill people in the Cameron Pass area in the past three days has put backcountry recreationists on notice. And the risk is expected to heighten over the next few days in the mountains west of Fort Collins. The slides at popular Cameron Pass and American Lakes were just two of the 54 avalanches reported to the Colorado Avalanche Information Center in the last four days, which accounted for nearly 80 percent of reported avalanches in Colorado this season." To read more, click here. --The Aspen Times is reporting that, "The White River National Forest is reaping increasing revenues in fees from Aspen Skiing Co. and other ski-area operators that use public lands. The 11 resorts in the White River National Forest paid $19.94 million in fees in fiscal 2016 compared with $17.92 million in 2015, according to the U.S. Forest Service. That is an increase of 11 percent. The stout increase reflects the strong year for the Colorado ski industry in 2015-16, when it topped 13 million skier visits for the first time, said Melanie Mills, president and CEO of Colorado Ski Country USA, a state trade group." To read more, click here. --Here is a very spooky short video of a skier triggered avalanche in Chamonix. Last week there was a close call in Colorado's Red Lady Bowl. A skier triggered a large D3 avalanche. Nobody was killed, but there are a lot of lessons to be learned. A group of profane climbers including the likes of Andy Lewis (Skandy!) and Ammon McNeely set out to make the iconic summit of Ancient Art into a Christmas Tree. Please note that there is profanity in this video and enjoy! 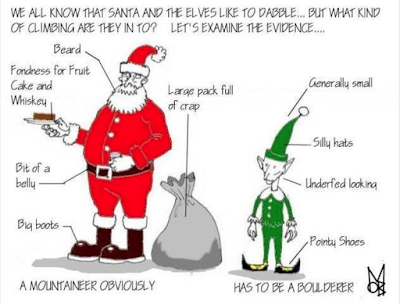 Merry Christmas and Happy Holidays from the American Alpine Institute...! WASHINGTON – On the heels of President Obama’s signing of the National Park Service Centennial Act, today the National Park Service and the National Park Foundation unveiled an impressive summary of the agency’s accomplishments, achieved with its partners and unprecedented public engagement, during its year-long 100th anniversary celebrations, and prepared to use the momentum and support that resulted from the centennial to launch into its second century of service. From the outset, the National Park Service established a centennial goal, to connect with and create the next generation of park visitors, supporters and advocates. Working with the National Park Foundation, NPS launched the Find Your Park / Encuentra Tu Parque movement to engage with younger audiences, while also celebrating with all Americans who love the national parks. More than one in three millennials became familiar with the Find Your Park campaign, which garnered nationwide attention through print and web media, public service announcements, public relations, live events, social media campaigns and donated advertising. Throughout the NPS Centennial celebration, the National Park Service and its partners conducted a broad range of activities and efforts to celebrate national parks and engage more Americans in their parks and public lands. Since its kick-off, the Find Your Park / Encuentra Tu Parque campaign has engaged hundreds of millions of people across the country and throughout the world. In 2015 and 2016, the National Park Foundation’s Find Your Park Expedition invited more than a dozen diverse social media personalities and bloggers to explore national parks and virtually bring along people everywhere by sharing their experiences online. The NPS and NPF strengthened their work with organizations whose mission is to connect and reconnect diverse audiences with parks, and will continue to build on those partnerships to ensure that national parks and their programs are accessible to all and tell a more complete story. The centennial and Find Your Park also saw great success on social media. The national parks were organically trending topics on both Facebook and Twitter during National Park Week in April 2016 and on the 100th birthday in August. During the centennial year, NPS national social media accounts added more than 1.2 million followers, while millions more followers were added to the 800-plus park and program accounts on multiple platforms. Additionally, traditional media coverage of national parks in 2016 is slated to eclipse any coverage measured in recent years. In 2017, the NPS will study changes in public awareness of parks and other NPS programs, as well as recent visitor demographics, which will add to the understanding about the impact of centennial activities on public awareness of the National Park Service and National Park Foundation. One of the nationwide initiatives celebrating the NPS Centennial was President Obama’s Every Kid in a Park initiative. This visionary program invited all 4th graders and their families to visit public lands with a free entrance pass to all Federal public lands and waters, including national parks. In the program’s first year, more than 100,000 passes were issued at national parks. Additionally, the National Park Service worked with partners to bring hundreds of diverse youth corps participants into parks, providing opportunities for young people to experience the broad array of professional career opportunities available in national parks. Throughout 2015 and 2016, parks, programs, and partners across the country hosted high profile events and special programs to celebrate the centennial, from the 2016 Rose Parade, to a performance by Mary Lambert at Stonewall National Monument, to a 100-park nationwide bioblitz and a solar car challenge relay across nine national parks. Celebrity events, concerts, 100-mile hikes, a national “picnic in the park” and thousands of other activities offered a variety of ways for visitors to join the centennial celebration. Since the launch of the Find Your Park campaign by the NPS and NPF in March 2015, more than 3,200 centennial events were published on the national calendar on nps.gov and FindYourPark.com. The centennial will leave a long-term legacy for the NPS that will continue beyond 2016. In planning for this benchmark moment for the National Park Service, the NPS and its partners articulated a vision for the agency’s second century of service and outlined a framework for achieving that vision in “A Call to Action,” released in 2011 and updated each year since. The NPS has made significant progress in advancing the objectives of the Call to Action: connecting more people to parks in America’s communities, advancing the NPS education mission, strengthening its preservation and conservation of America’s special places, diversifying its workforce, and engaging the next generation of park stewards and supporters. Initiatives started in 2015 and 2016 will continue to develop, including Every Kid in a Park, Centennial Challenge projects, increased engagement with youth service corps organizations, new and improved facilities, the NPS Urban Agenda, and more. In addition, the NPS and NPF will build on the public-private partnerships created and strengthened through the centennial to leverage more public and private support for parks and NPS programs. The National Park Service Centennial Act will provide new tools, revenue and authorities that will help the NPS meet the challenges of its second century. Among its many provisions, the bill establishes an endowment fund with the NPF for projects and activities in support of the NPS mission, extends hiring eligibility of participating youth in the Public Lands Corps, and affirms the importance of interpretation and education in pursuit of the NPS mission. Planning is underway to evaluate and build on the success of Find Your Park / Encuentra Tu Parque as the National Park Service, the National Park Foundation, and other partners will continue the momentum of the campaign in 2017. The Find Your Park movement will continue to engage new audiences, especially during National Park Week in April and the NPS 101st birthday in August. NPS and its partners invite the public to explore new parks, build personal connections to the remarkable places in their communities, and find ways to help ensure that future generations are able to experience America’s treasures. Some of the most admired companies in the world are supporting the National Park Foundation's efforts for Find Your Park/Encuentra Tu Parque, including American Express, Budweiser, Subaru, REI, Humana and Disney. Additional partners include Coleman and Coca-Cola. More information about the success and long term legacy of the NPS Centennial is available online here:https://www.nps.gov/subjects/centennial/success.htm. More than 20,000 National Park Service employees care for America's 413 national parks and work with communities across the nation to help preserve local history and create close-to-home recreational opportunities. Visit us at www.nps.gov, on Facebook atwww.facebook.com/nationalparkservice, Twitter www.twitter.com/natlparkservice, and YouTube www.youtube.com/nationalparkservice. The National Park Foundation is the official charity of America's national parks and nonprofit partner to the National Park Service. Chartered by Congress in 1967, the National Park Foundation raises private funds to help PROTECT more than 84 million acres of national parks through critical conservation and preservation efforts, CONNECT all Americans with their incomparable natural landscapes, vibrant culture and rich history, and INSPIRE the next generation of park stewards. In 2016, commemorating the National Park Service's 100th anniversary, the Foundation launched The Centennial Campaign for America's National Parks, a $350 million comprehensive fundraising campaign to strengthen and enhance the future of these national treasures for the next hundred years. Find out more and become a part of the national park community at www.nationalparks.org. --Kamloops This Week is reporting on a trend that we expect to be more prevalent in the mountain rescue community in the coming years. "Kamloops Search and Rescue is one of two groups in B.C. licensed to use drones to search for missing people. The provincial emergency management agency approved Kamloops and Coquitlam on one-year pilot programs to utilize unmanned aerial vehicles, or drones, in real-life searches." To read more, click here. 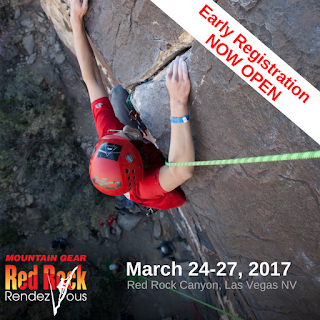 --Clark County is trying to sue the Save Red Rock group. The county apparently doesn't like the opposition the group has nurtured to the potential housing development across the street from Red Rock Canyon on Blue Diamond Hill. The group is now seeking funds to defend their right to oppose this development. To read more, click here. 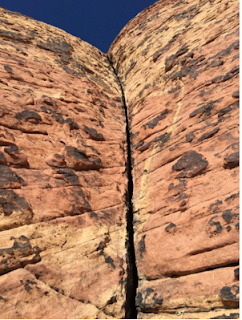 --It appears that the sign for Red Rock Canyon was vandalized by climbers doing a photoshoot this week. A witness states that the people hanging on the sign were wearing exagerated climbing gear and when they broke the sign, they thought it was funny. To read more and to see an image of the sign, click here. --A dog was caught in a hunter's trap last week near Mt. Potosi. It appears that the individual who has set these traps has also placed them around the Red Rock Campground. To read more, click here. --The Desert Sun is reporting that, "A sloping piece of the Mojave Desert that rises into rugged hills next to Joshua Tree National Park was bought more than a decade ago by a company that planned to turn it into a subdivision. Instead, the 640-acre property will become a protected area for hikers, mountain bikers and equestrians, and for wildlife from bighorn sheep to mountain lions." To read more, click here. --The ABC affiliate in Denver is reporting that, "A Colorado man died after a tragic ski accident at the Breckenridge Ski Resort on Monday, officials announced. Authorities confirmed the first skiing death of the year Tuesday afternoon, describing a 48-year-old man's death as a serious accident." To read more, click here. --It appears that some anchors have been vandalized in the Ouray backcountry. So far it's been confirmed that the bolted anchors in Second Gully and on Portland Falls have been chopped. --Steamboat Today is reporting that, "The fine print on the trail maps and signage at backcountry access gates now alert skiers that they can be charged up to $500 per person for rescues at the Steamboat Ski Area. 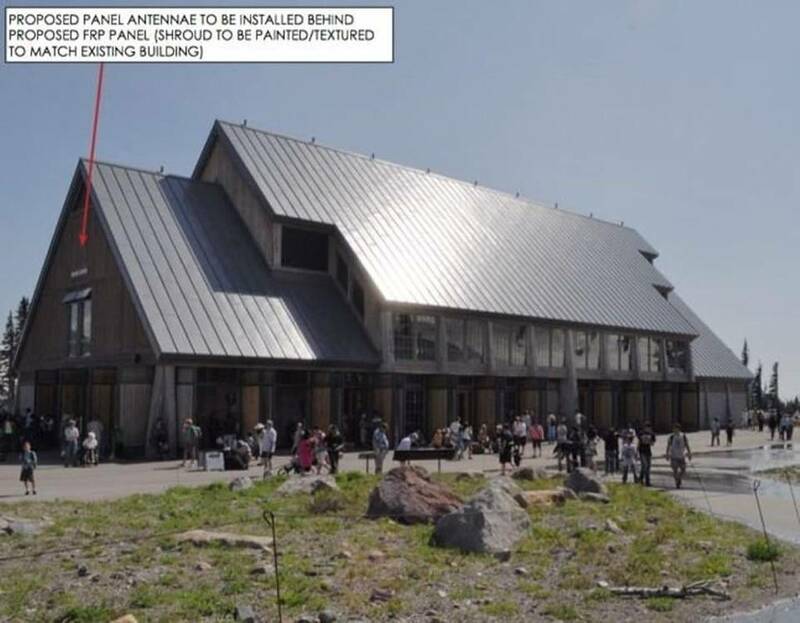 The policy is new this year, and the ski area hopes it will deter inexperienced skiers from going places they do not belong." To read more, click here. --The Aspen Times is reporting that, "Aspen Skiing Co.’s vision of building Snowmass Ski Area into a bigger powerhouse in the ski industry is expected to get back on track Thursday. Skico and two partners anticipate they will complete a multimillion dollar deal to purchase the undeveloped property at Snowmass Base Village as well as the commercial space and Viceroy Hotel. To read more, click here. --Jackson Hole News and Guide is reporting that, "No skiers will be criminally prosecuted in connection with Thursday’s massive avalanche on Teton Pass, officials said. Despite initial suspicion that skiers may have been responsible for the large slide that hit a vehicle and closed Highway 22 to thousands of commuters, investigators are no longer sure." To read more, click here. --The Access Fund is reporting that, "A major win may be on the horizon for Texas climbers. After targeted advocacy efforts by Access Fund and local climbers, State Representative Ryan Guillen filed House Bill 487 last week to add rock climbing as a defined activity in the Texas recreational use statute. If passed, this bill will limit the liability of landowners who open their property to climbing." To read more, click here. --Well, somebody's out there cleaning up America's scenic trails! --Fake news has been in the news a lot lately. So our friends over at Evening Sends have put together a funny -- but profane with naughty language and all -- post about the best fake climbing news this year. To read the post, click here. 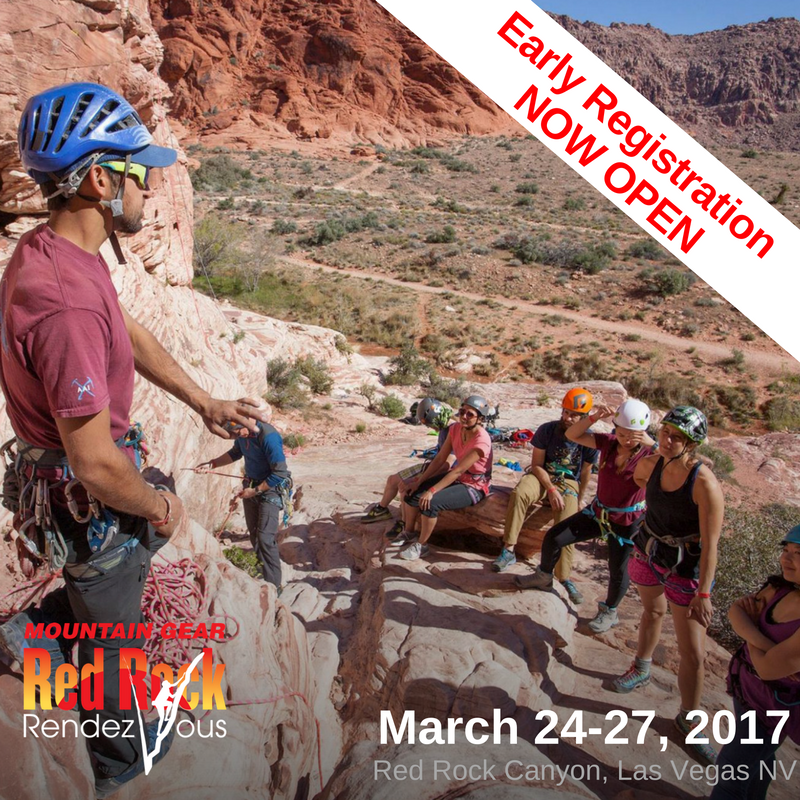 The American Alpine Institute just received this email from Save Red Rock. We have donated to this cause. Please consider doing the same! 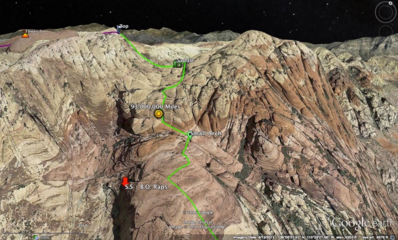 If you've heard the news, it feels like Red Rock Canyon is under attack. For over a decade, housing developer Jim Rhodes has been trying to build a city of more than 5000 homes and businesses in rural Red Rock. 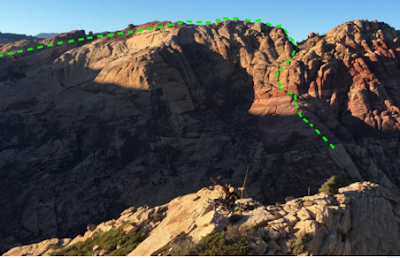 Last week, Clark County shockingly sued Save Red Rock, seeking to bar consideration of anyone’s concerns about this concept plan and invalidate it's own Planning Commission’s unanimous denial of it. If Clark County wins the lawsuit, it will open the door for Rhodes to build his new city, bring massive amounts of traffic to Red Rock, and ruin the peaceful experience. 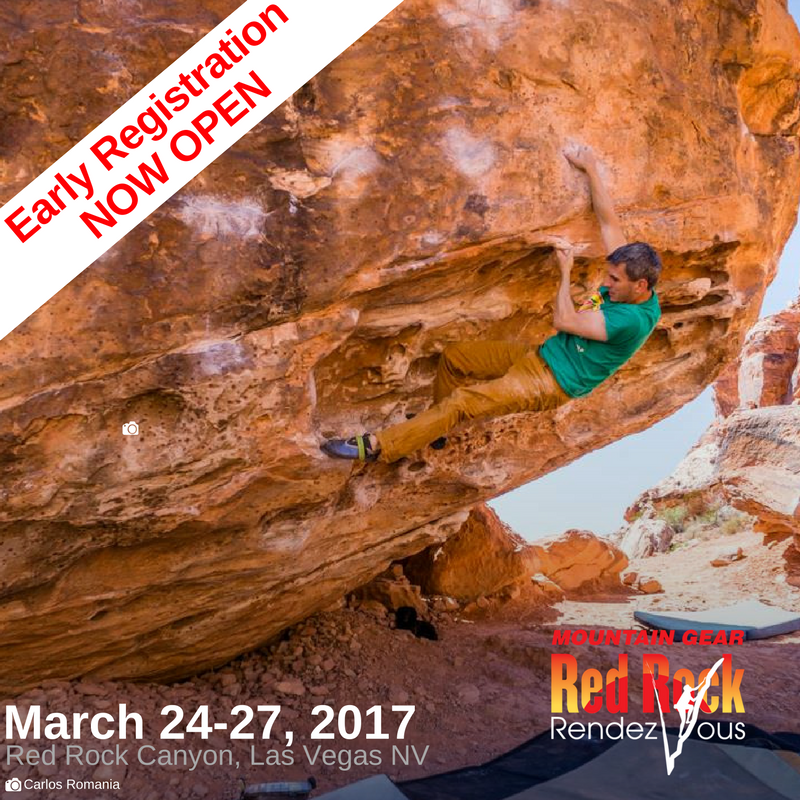 Red Rock needs your support. Any amount helps. Together we can stand strong and bright like this rock against the storm over the canyon. 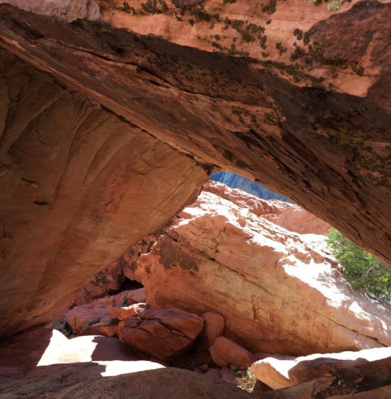 Save Red Rock is fighting to be able to continue to work together with all parties towards a solution that would preserve the rural character of the canyon. A rural rights preservation solution would respect the developer’s property rights to the rural zoning that he bought, respect the citizens’ rights to the public process, and respect the commissioners’ rights to vote on whether or not a zone change to a higher density is appropriate for the area. The county lawsuit claims that an old 2011 development plan that expired in 2014, didn’t expire, and therefore, the new 2016 plan cannot be heard and none of these rights considered. You can find the official lawsuit document, the developer's concept plans, news clippings, etc. on http://www.saveredrock.com. You can also find lots of good news - all the successes and protective laws that your support has helped Save Red Rock secure over the years in Red Rock Canyon. We appreciate all your support. Thank you so much. Together we stand, solid as a rock, Red Rock! In October, AAI Guide Tad McCrea, Jason Kruk and Joel Kauffman established a 5000-foot new route up the South Ridge of the unclimbed Chaukhamba III (6974m) in the Garhwal region of the Indian Himalaya. The team made a very lightweight ascent, spending six days on the route. Tad says that the adventre was an "odyssey that was mind bending, time transcending and ego breaking..."
The new route is SAB KUCH MILEGA (No Fun Allowed!). The route clocks in at 1600m, 5.10, A0, AI 4+. A preview of what’s in store for the day. I would like to offer some great route beta for one of my favorite 5.7s in Red Rock Canyon—93,000,000 Miles. I refer to the climb as such because if you push for the summit of Rainbow Mountain, you’re in for a long day with lots of climbing, scrambling, and hiking. Going for the long burn, as they say. 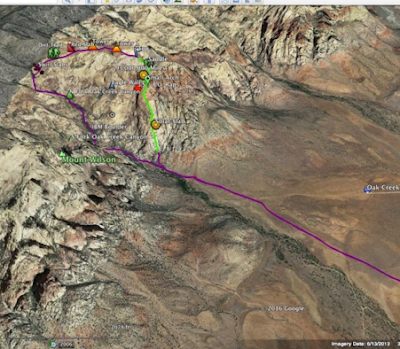 With that being said, this linkup of 3 different routes provides one of the longest moderate routes in Red Rock, at 5.7. 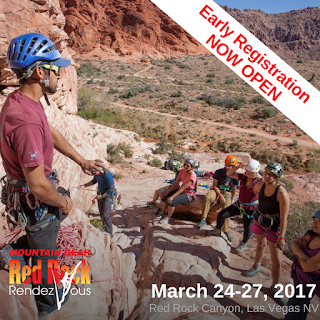 Add to that what I feel to be THE most spectacular descent I’ve done in Red Rock and you’ve got yourself a classic adventure route. I’ve done it 3 times now! Photo with approximate ascent route. Photo taken from The Warrior on Cactus Flower Tower. If you plan to go for this route, you want to try to be first at the wall or at least first on the upper tier of Solar Slab. I hike in early from the parking area 0.5 miles past the Loop Road exit. You zigzag through the fence and follow a trail that joins with the main trail coming from the Oak Creek parking lot. The two times I did the route in November, we left the trailhead at 0530. 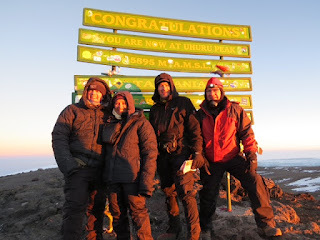 The time I climbed in December, we left at 0600. You’re shooting to be climbing at first light or shortly after. Make your way to the 500’ high upper tier by climbing Johnny Vegas (5.7), Beulah’s Book (5.9), or Solar Slab Gully (5.3) if you want to move fast. The one time I went up Solar Slab Gully, we were on the upper tier just before 8 AM. The other two times, we went up Beulah’s Book and were on the upper tier between 8 & 9. Next, head up the1300' Solar Slab. We topped out Solar Slab around 12 - 1. 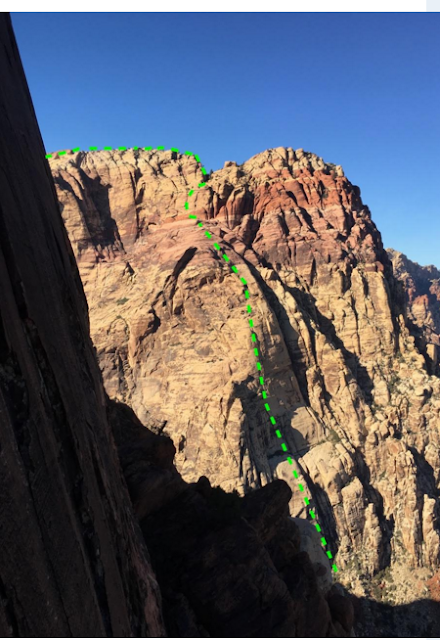 Now, once you’ve topped out, you want to continue heading up the slabs, making your way towards the multi-colored headwall above. This is mostly Class 2 hiking, with a steeper Class 3 slab that should take you to a small arch. Go through this “black hole” and enjoy a good shady spot here out of the sun. Here’s where you leave everybody behind as you continue with upward progress towards the summit. Retreat from above this point almost necessitates going up and over, so commit to the big day and keep moving. Having lunch in the shade provided by the black hole arch you crawl under. Head climbers’ left from the arch, staying close to the wall on what looks like a sandstone sidewalk. After a minute, there is a short scramble up to a nice bench of rock and the official start of 93,000,000 Miles. You’re looking for a left-arching seam that eventually turns into a protectable crack. Launch off on awesome moon-like huecos, join the crack, and build a belay in the "cockpit". Photo of upper portion of route showing the top of Solar Slab and on. Photo taken from the summit of Cactus Flower Tower. Looking out towards Mt. Wilson and Cactus Flower Tower from the “cockpit” belay on 93,000,000 Miles. The single rope or down-climb descent of Solar Slab is the gully directly below the pitch. The standard Painted Bowl descent is barely visible in the pinkish rock behind. Next comes what may be the best pitch of climbing all day. It is also the last technical pitch of the day. You’re WAY up there at this point. The day is growing long. But you’re scrambling and hiking after this. Get to take the climbing shoes off soon. You’re almost to the top and will move quicker in the easier terrain. So here it is—Blast off up an incredible crack through a small bulge with great feet. It’s a little wide to start—a #4 Camalot works well here. Higher up, it turns into glorious hands, thin hands, and big fingers. I usually end the pitch in a nice alcove on a big ledge. Glorious crack on the last pitch of 93,000,000 Miles. Scramble up and left to a huge tree. Walk back right into a corridor for shade if you’re still getting hammered by the sun. Switch shoes out here but keep the rope handy for some 4th class scrambling higher up. Continue further into the corridor and scramble and chimney up a rail that will get you out of the corridor. Head up the vegetated gully towards the saddle above. When you get there, head left and up, following the path of least resistance and sometimes cairns. Eventually this leads you to an easy chimney and the summit ridge. Follow the ridge and tag the summit! We summited between 2 and 3 PM. Celebrate your achievement and get ready for the down. You still have 3 - 4 hours to go. All the gear goes back in the pack on the summit. Mostly hiking and easy down-scrambling from here on out. Anyway, head away from the city, back towards the limestone. Off in the distance is a big butte. Pass it on the right and head through a wooded area. Contour across loose scree, slabs, and more vegetation towards another butte. This is where the Eagle Wall descent meets up. Pass the next butte on the right as well. You should pickup a trail around here if you haven’t already. You’ll drop down to the right a bit, then head back up left towards another saddle. Once at the saddle, you’ll head down a long red slab. Towards the bottom, you’ll pickup a dirt trail on the right. Follow the trail into a lovely swirled slab. The swirled slab heads down towards Oak Creek Canyon. At the bottom of this slab, head into the trees and emerge on the other side on more slabs. This is my favorite section of the descent. Absolutely stunning. The rest of the route is fairly straight forward from here. Find your way down the slabs and into the heart of Oak Creek Canyon. Parkour your way down boulders, slots, and maybe a tree or two. This section is also a lot of fun. As you get close to the mouth of the canyon, keep an eye out left for the exit back to the trail that passes by the start of Solar Slab. There are a few exit points as I’ve come to learn, so don’t stress—you’ll find it. That pretty much makes the loop out of it. You’ll know where to go from here. Make sure you catch the right trail back to the parking outside the Loop Road. It’s a diagonal right at a heaping pile of rocks. You’ll see it on the way in. This truly is an amazing adventure. The actual climbing is only a small piece of the big pie you’re eating. When you leave everyone behind after climbing Solar Slab, you enjoy the rest of the day in solitude. You’ll be wayyy out there as you descend smooth slabs like I’ve never seen before as the sun goes down. You’ll start to feel the whole day as you use your entire body to down-stem slots between boulders in Oak Creek. And lastly, you’ll enjoy a gratifying and reflective last hour of the day on a trail that gets easier and easier as you near the car. Beers and food awaits. And maybe a day of sport climbing tomorrow. --A skier died in a tree-well incident this week at Alpental Ski Area. To read more, click here. To read about how to avoid this danger and what to do if you do fall into a tree-well, click here. --The Bozeman Daily Chronicle is reporting that, "Officials have identified the skier who died Sunday afternoon in an avalanche north of Cooke City, Idaho. Christopher Peterson, 55, of Ketchum, Idaho, was killed after being buried in an avalanche on the north slope of Henderson Mountain. The Gallatin National Forest Avalanche Center said in a Facebook post that the avalanche was 3 feet deep, between 80 and 150 feet wide and covered 250 feet vertically. It occurred in an area the center described as “a terrain trap of trees.” To read more, click here. --Kiro 7 is reporting that, "An avid skier who was lost and missing overnight at Crystal Mountain Resort was found safe Monday after he managed to ski through miles of forest in the Mt. Rainier National Park to a closed section of highway where he texted his wife and authorities for help." To read more, click here. --The Baker Beacon Rally will take place on December 17th at Mt. Baker Ski Area. This is a free community avalanche education event. AAI will be providing clinics at the event. To read more, click here. --There was an avalanche fatality in a closed area adjacent to a Lake Tahoe ski resort over the weekend. Here is the report from the Sierra Avalanche Center. Here is a news report about the incident at Mt. Rose. --The Reno-Gazette Journal is reporting that, "a 35-year-old ski instructor was killed in a skiing accident over the weekend at Northstar California resort just north of Lake Tahoe. Dennis Baltimore died after he hit rocks and crashed into a creek near the Village Run slope, Placer County Sheriff’s Sgt. Dave Hunt said Monday. To read more, click here. --Okay. This is insane. 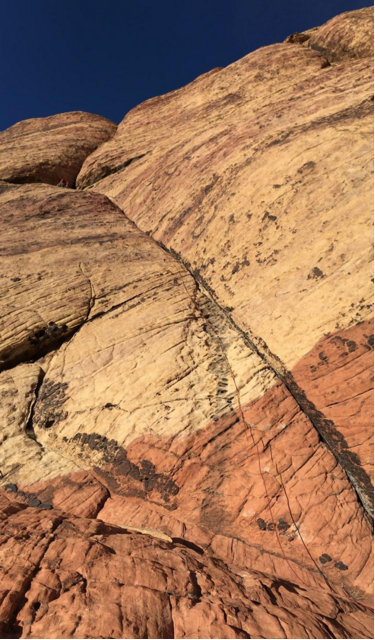 Save Red Rock is reporting that, "Clark County has filed a preemptive lawsuit against Save Red Rock (SRR), a grassroots conservation organization that has worked for over a decade to protect the rural, recreational and scenic nature of Red Rock Canyon National Conservation Area (RRCNCA). The lawsuit is an attempt to silence SRR’s opposition to a concept plan presented by developer Jim Rhodes’ Gypsum Resources, LLC (Gypsum) that asks the County to rezone land currently deemed rural to a non-conforming high-density zoning. The Gypsum plan includes a 2,010-acre development with more than 5,000 homes on Blue Diamond Hill, located within Red Rock Canyon adjacent to the RRCNCA." This is unprecedented and everyone should donate to this organization. To read more, click here. --Red Rock Rendezvous will take place from March 24 to 27. 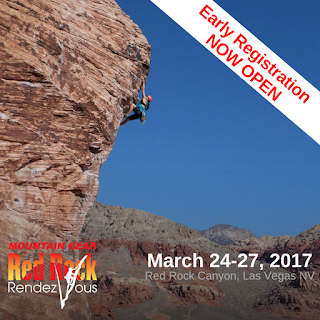 This is the premier climbing event of the year. 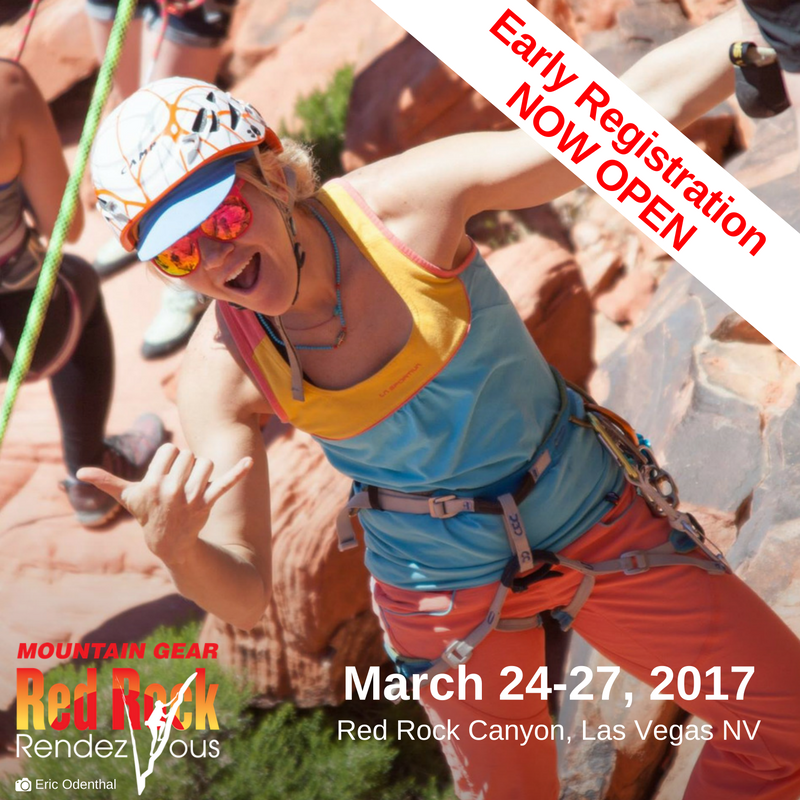 Early registration is now open. Early registration allows you to save money and while also providing you with better clinic options than when you register closer to Rendezvous! To register for the event, click here. --The Las Vegas Review Journal is reporting that, "A total of 30 conservation and recreation initiatives were selected to share more than $79 million set aside under the Southern Nevada Public Land Management Act, which has doled out over $3.5 billion for more than 1,200 projects across the state since 1998." This includes Red Rock Canyon. To read more, click here. --The Press Enterprise is reporting that, "Joshua Tree National Park, the nation’s 15th largest National Park, is poised to grow by more than 20,000 acres early next year. After a lengthy study and environmental assessment, the National Park Service recommends adding more than 20,000 acres of federal, state and private lands to the boundary of Joshua Tree National Park." To read more, click here. --One of the Ice Climbing World Cup events will take place in Durango this weekend. To read more, click here. --There were at least two near miss avalanche incidents in Colorado last week. To read more, click here. --Here's an accident report from the Rabbit Ears area concerning a double-burial. --Sunlight Mountain in Glenwood Springs is now the priciest resort in the country. Tickets are now at $700 per day!!! To read more, click here. --There is currently a move to expand helicopter ski access in Silverton. The town of Silverton does not apparently support this. To read a letter to the editor, click here. --Two skiers have died of what appears to be natural causes at the Killington Ski Resort in Vermont. To read more, click here. --Grind TV is reporting that, "While backcountry skiing and snowboarding continues to grow in popularity, a harrowing scenario unfolded over the past few days in the Tetons with 10 separate human-triggered avalanches reported since Friday. As reported by the Jackson Hole News and Guide, since Friday the Bridger-Teton Avalanche Center has received reports of seven avalanches in the area caused by skiers, two caused by snowmobilers and one caused by snowboarders." Among these, there was one fatality. To read more, click here. --Alpinist magazine has recently published an interview with Brady Robinson. Brady is the executive director of the Access Fund. In the interview, Brady talks about climbers, public lands and their future. To read the article, click here. --The 2017 Mugs Stump climbing grant award winners have been announced. The grant -- which is only provided to small teams that intend to move light and fast -- has been awarded to five teams. To see the list of who won and what they want to do, click here. --The outdoor industry is not officially on the political map. We all know that the industry is massive, but a new government bill will begin to track it. Outside magazine is reporting that, "thanks to the passage of a bipartisan bill that sailed through both the House and Senate last month, and was signed into law by President Obama on December 8, the outdoor industry is primed for a gargantuan reveal. The Outdoor Recreation Jobs and Economic Impact Act of 2016, or REC Act, authorizes the Department of Commerce’s Bureau of Economic Analysis to assess outdoor recreation’s contribution to the nation’s gross domestic product, or GDP." To read more, click here. --The Orange County Register was reporting that, "what began as a possible burglary investigation at a home in the gated Turtle Ridge community late Monday night evolved into a nearly 13-hour hazardous materials probe after two police officers discovered white powder scattered through the home and reported feeling dizzy, authorities said Tuesday." It turns out that the culprit in the dizziness was a gym climber's favorite inhalant: climbing chalk! To read more, click here. --Powder Magazine has published an interesting and eye-opening editorial about skiers who bring their dogs with them into the backcountry. To read the editorial, click here. --The Outdoor Alliance has a short piece on the likely new Secretary of the Interior, Representative Ryan Zinke. The Secretary of the Interior has a direct impact on public lands and out outdoor recreationalists interact with them. It can be argued that this is the most important position in the new administration for our community. To read more, click here. --The New York Times has published an excellent interactive chart on how the new administration can impact climate change. The quick and easy to read chart shows what will happen with several different scenarios. To read the article and see the chart, click here. There is one area that can be very sketchy. Imagine that you are on steep terrain wearing your skis and you have a cliff below you. You need to make a turn to get out of the terrain. The best option is a downhill stationary kickturn. Outdoor Research and the American Mountain Guides Association teamed up to bring you this video of AMGA Instructor Team Member, Margaret Wheeler, demonstrating the turn. --Washington-based climber Craig Gorder was seriously injured in a climbing accident on November 15th in Indian Creek. There is currently a Go-Fund-Me site up to help him pay for his recovery and the medivac flight that saved his life. To read more, click here. An instructor demonstrates an avalanche snow pit in the Baker Backcountry. --The Reno Gazette Journal is reporting that, "California’s winter resorts have more safety measures in place than they did five years ago, but just barely. That’s according to the California Mountain Resort 2016 Safety Survey. The report, published by the SnowSport Safety Foundation, surveyed safety measures at 19 ski and snowboard resorts, including many in the Lake Tahoe area." To read more, click here. --There is significant fear amongst conservationists that the incoming Trump Administration will revoke President Obama's recent creation of National Monuments. To read more, click here. --Aspen Public Radio is reporting that there were five human triggered avalanches this week. To read more, click here. --The San Juan Independent recently published an extensive article on the history and the problems that exist within the Ouray Ice Park. If this is a place you enjoy, this is an excellent piece of reporting that gives real insight into the area. To read the article, click here. --The UIAA is running part of the Ice Climbing World Cup Series in Durango. But they're short on funds. Check out the GoFundMe site for more info. --There have been three accidents/close calls in the Canadian Rockies this year. A pair or climbers at the base of Kidd Falls (WI 4) were almost swept away in an avalanche. 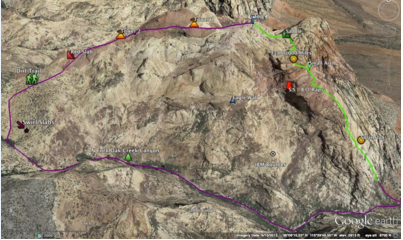 A climber on Kemosabe (WI 4) took a lead fall, pulled two screws and had to be helicoptered out. And a climber was caught at the base of Gimme Shelter (WI 6) on Mt. Quadra. To read more, click here. --Leave No Trace is hiring its Subaru Traveling Trainers. To see the job listing, click here. Rocky Mountain National Park will be hosting a Job Information Session on Tuesday, December 13, from 4 to 7 p.m. at the Beaver Meadows Visitor Center. Come learn about the job application process for Rocky Mountain National Park and how to apply online for specific jobs at the park. Information will also be available regarding park volunteer opportunities as well as fellowship positions with Rocky Mountain Conservancy. So here are some things that climbers might like that mostly won't break the bank. One of the biggest problems with being in the backcountry is the ability to recharge your devices. You should never plug a device directly into a solar panel. This will drain the device unless you have perfect light. Instead, you should consider charging a battery pack (sometimes called a battery bank). Then charge your device from this. A battery pack alone might be enough to get you through a day or two. A solar panel might not even be necessary. Goal Zero has several battery pack and solar panel options available. Check them out, here. Last year my mother bought me a chalk bag and chalk. She doesn't really understand what I do or why. And my chalk bag was absolutely falling apart. This was one of the best gifts ever. I was super psyched that my mother was supporting my climbing and it was also something that I really needed that I didn't want to buy for myself. 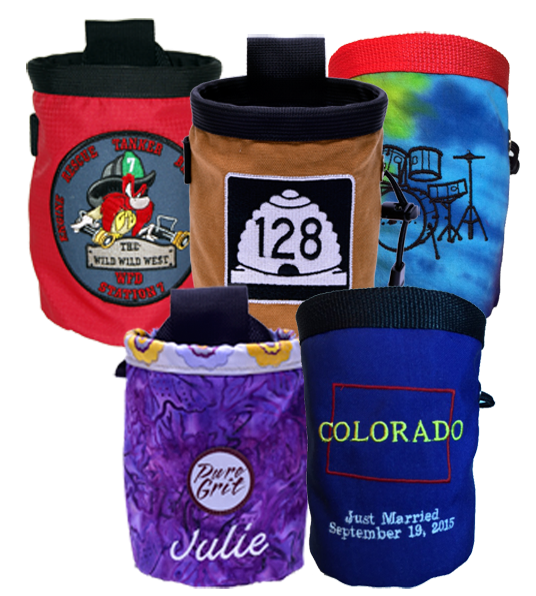 Chalk bags come in all types. You can get cool kitschy bags, and you can get plain jane bags. If you poke around on the net, you will find every kind you can imagine. 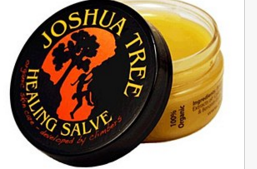 Skin Salve is one of those things that a lot of climbers don't buy, but they need. It's especially useful when people go on climbing trips where there is an intensive amount of climbing over a short period of time. The are lots of salves available. These include brands like Giddy, Joshua Tree Healing Salve, Burt's Bees and Metolius. 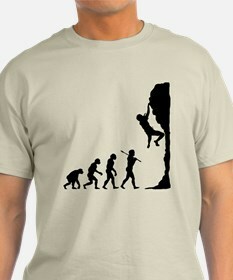 There are a lot of funny climbing shirts out there. Cafe Press usually has a handful that are fun. Look Human has some good ones. And of course, there's always Etsy. Multi-pitch climbers generally carry a knife to cut cord and webbing for rappels, but there are only a few out there that are climber specific. 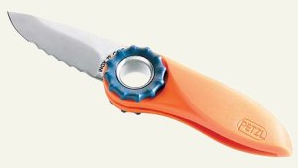 The Petzl Spatha is a great knife with a carabiner hole. The Trango Shark Nut tool is both a nut tool and a knife. And the Trango Piranha Climbing Knife is a nice compact knife for a climber. A wide-mouth water bottle that also acts as a hot and cold thermos is an awesome gift. Hydroflask provides the most popular model right now, but there are a lot of others out there. 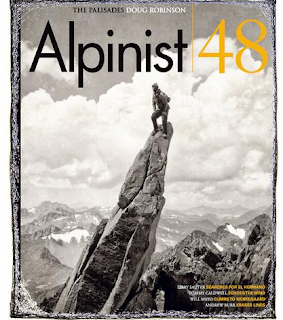 There are four major magazines that climbers read in North America. They are Alpinist, Climbing, Rock and Ice and Gripped. 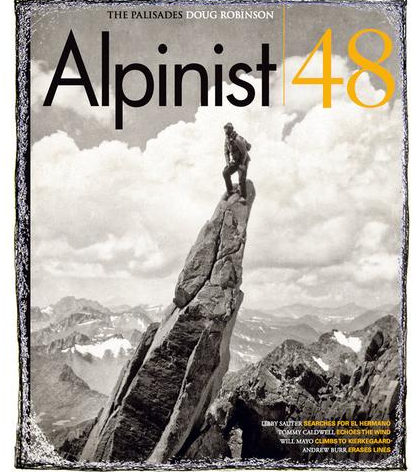 Alpinist is probably the best magazine for the alpine climber. Climbing and Rock and Ice are very similar to one another and cover everything from bouldering to big wall climbing. And Gripped is a Canadian oriented magazine. 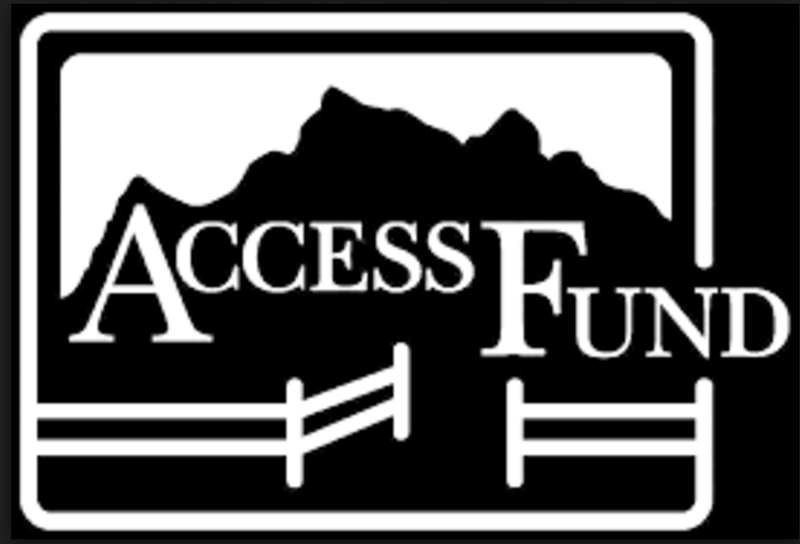 The Access Fund is an organization that lobbies for climbers. 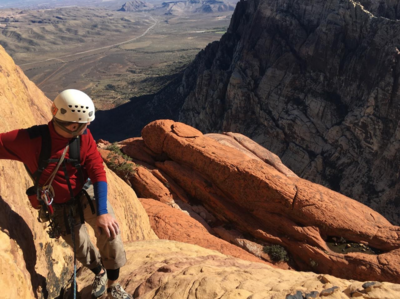 Their primary mission is to keep public lands open for climbing. This is an excellent organization to support. The American Alpine Club lobbies for climbers, but also supports them in other ways. They provide two yearly publications: The American Alpine Journal and Accidents in North American Mountaineering. They also provide rescue insurance, lodging discounts in certain climbing areas, and grants for climbers. 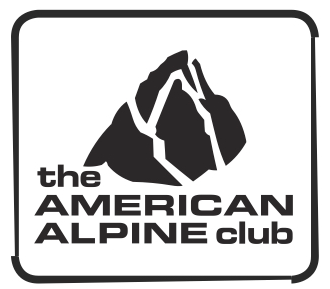 If you're reading this blog, you probably already know that the American Alpine Institute is a climbing school and guide service that operates in six states and sixteen countries. The organization's mission is to provide world class mountain education, exceptional guided experiences and to inspire natural preservation. We have programs for all levels of climber's and skiers, from rank beginners to extremely advanced... We know that this doesn't exactly count as a "cheap gift for a climber," but it is -- without a doubt -- the best gift on this list... Check us out! Three climbers on our December 2nd Ecuador expedition are using their trip to raise funds for clearing landmines in Angola. Mike Schipper, Deli Ford and Andrew Ford will be climbing Cayambe, Antisana, and Chimborazo, making South America their third continent in five years to climb in for fundraising efforts. 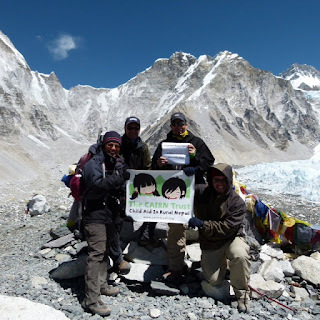 They collectively raised $5,300 on previous expeditions, including Everest Base Camp in support of the Cairn Trust (raising funds for children's education in rural Nepal) and Kilimanjaro in support of the Freedom From Fistula Foundation (raising funds for women's health in Africa). This year the group, two of whom currently live in Angola, decided to support the humanitarian work of the Mines Advisory Group, which has been clearing landmines left behind from Angola's long civil war for over twenty years. "Using our expeditions to raise funds for good causes is really motivating" said Andrew. "It helps make all the training worthwhile and definitely keeps us going when it gets tough on the mountain!" If you would like to help save lives in Angola by supporting Mike, Andrew and Deli - who somewhat fittingly call themselves the "MADs" - please visit www.justgiving.com/madsdochimborazo2016/ and make a donation. Thank you!